Daily Resort Charge will be added to the room rate and includes Guest internet access/ self parking DVD NOW with unlimited movies 2 16 oz. 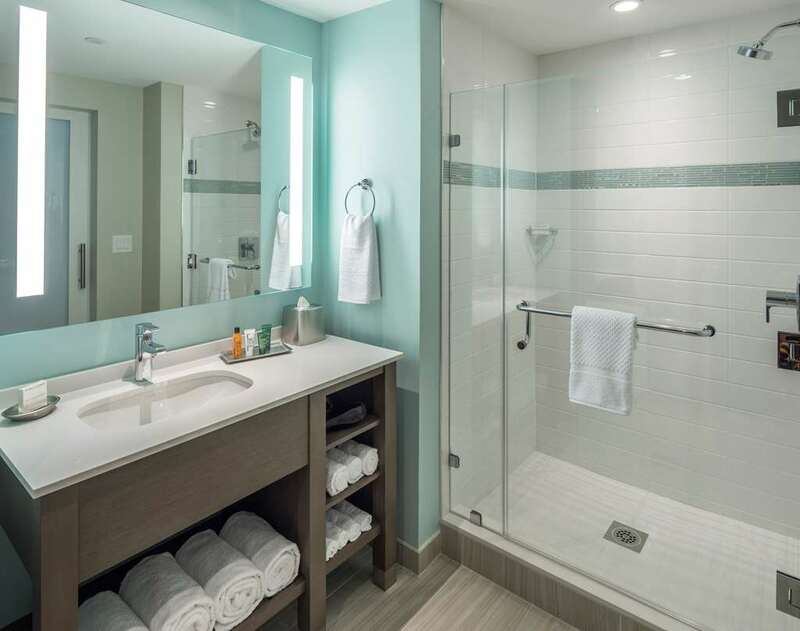 bottles of water per day 1-800/local calls A fantastic beachfront setting the hotel is moments away from many Myrtle Beach attractions including beautiful golf courses lively country music clubs and Broadway on the Beach offering exciting shopping dining and entertainment options. Just eight blocks away Myrtle Beach Boardwalk is a popular beachfront promenade. home to lively bars beachfront eateries souvenir shops thrilling rides and an arcade. Our location is just two blocks from the Myrtle Beach Convention Center Spacious 1- 2- or 3- bedroom suites complete with a fully-equipped kitchen and a large master bedroom. Partial or full ocean views from your open balcony. Take advantage of in-suite washer/dryer laundry facilities. Cool down with a refreshing dip in the outdoor swimming pool at this Hilton Grand Vacations hotel in Myrtle Beach. Unwind in the indoor pool or whirlpool or work out with contemporary Precor exercise equipment in the complimentary fitness center while the kids enjoy video games and crafts in the Activity Club. Pick up coffee fresh pastries light snacks and crisp salads from our grab-and-go* deli. Sip cocktails as you soak up the sunshine in the pool bar or relax with a glass of wine in the inviting Lobby Lounge. Daily Resort Charge will be added to the room rate and includes Guest internet access. self parking. DVD NOW with unlimited movies. 2 16 oz. bottles of water per day. 1-800/local calls. Sky Bar: Located on the Lobby level Sky Bar provides a full bar including a selection of specialty craft cocktails as well as local craft brews. Marketplace orders may be placed at the bar. The Perch Pool Bar: OPEN SEASONALLY. Our oceanfront pool bar located on the lower entrance level. Enjoy one of our signature frozen specialty drinks while taking in beautiful views. Daily Happy Hour from 4p to 5p. Marketplace: Carrying a variety of groceries retail sundries and proudly brewing Starbucks coffee. Located on the Lobby level the Marketplace also provides a selection of breakfast sandwiches lunch wraps paninis and signature house made pizzas for carryout. Call ahead ordering available. Margaritaville: The island-inspired menu offers something for everyone with classic American and regional favorites. Soho Cafe: Eclectic Japanese-Mediterranean fare served in a sleek eatery with an after-dinner nightlife scene.